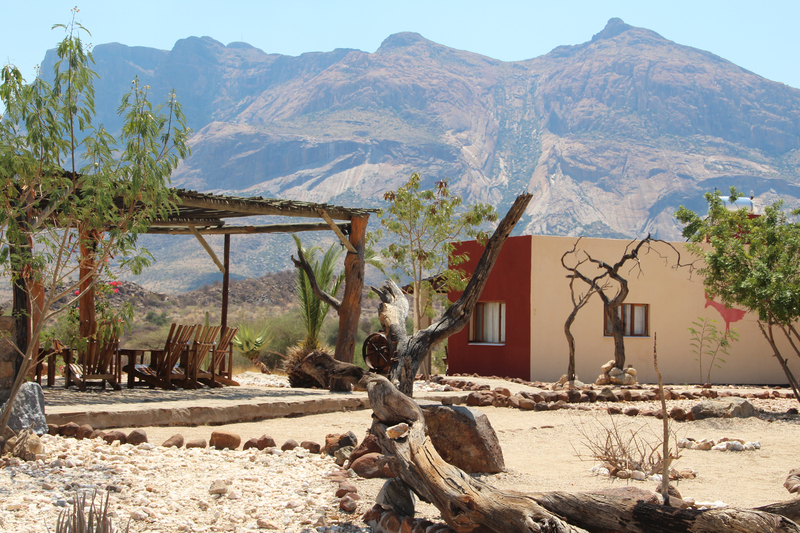 The Hohenstein represents the impressive western edge of the Erongo mountain range. In the evening, spectacular sunsets above the desert plains bathe the mountain in a fantastic red light. Have a drink on the terrace and enjoy the exceptional view. Accommodation is offered in 14 spacious en-suite rooms, each with a safe, and a shady terrace. The reception area and restaurant are located in the main building, which is connected to the swimming pool and bungalows by paved walkways. Two of the rooms are wheelchair-friendly. Children of all ages are welcome. 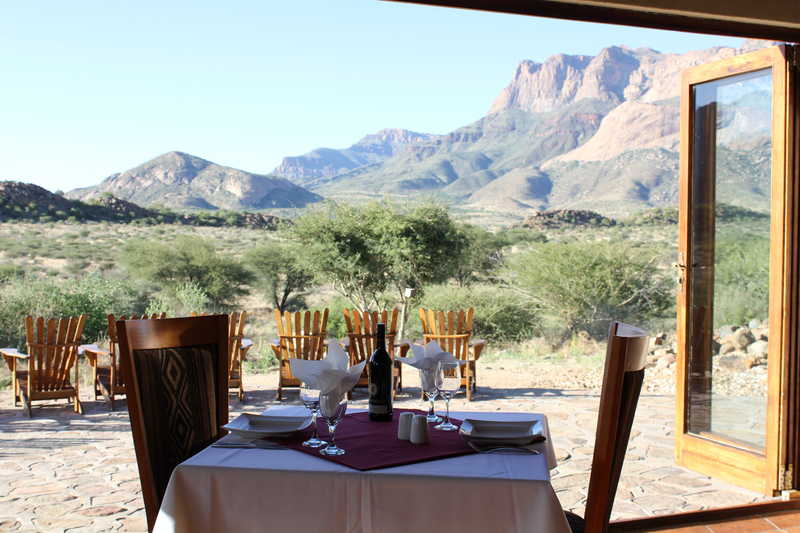 You are welcomed with a refreshing drink, served on the panorama terrace of the lodge, situated at the foot of the highest mountain in the Erongo Mountain Range. Arrival at the Lodge not later than 2pm. Otherwise it could be too late for the afternoon activities. Accompanied by an experienced guide, the afternoon excursion takes you to the “Boulder Forest”, characterised by spectacular rock formations and luscious vegetation. On the steep mountain slopes, semi-precious stones like Tourmalines, Aquamarines and Mountain Crystal are found. You are given a glimpse into the work and life of the small miners, working on the slopes and hoping for the one big find. On the descent you are treated to spectacular views, with the sun setting behind the majestic Spitzkoppe mountain. A twenty minute drive takes you back to the lodge, where a 3-course dinner awaits you. Etemba has hosted guests from Europe from as early as 1960. 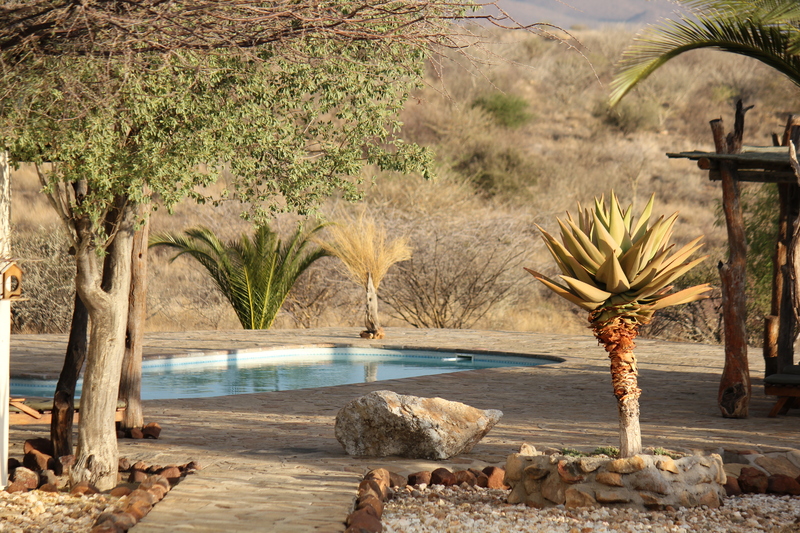 A spectacular landscape has evolved between the peaks of the Erongo Mountain Range and the riverbed of the Omaruru. Situated at a historical gathering place of the bushmen, is the newly built Etemba Wilderness Camp. After a short rest with coffee and cake, you will be taking a walk to the famous bushmen paintings, which have been declared a National Monument more than 50 years ago. At night you will enjoy a traditional braai in the spectacular setting of the camp, amidst gigantic rock boulders.